Volleyball rules and regulations for sanctioned volleyball organizations such as USAV, NCAA, FIVB, and National Federation. 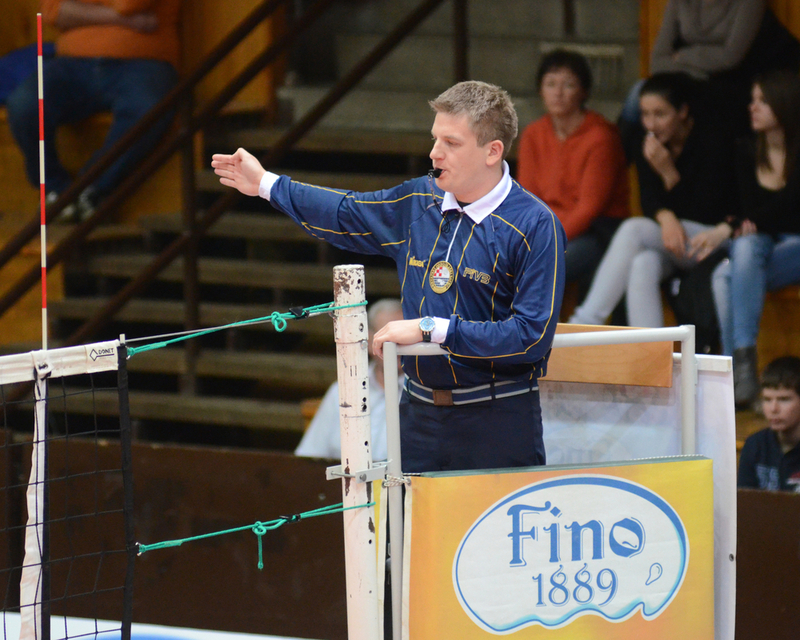 The work crew for a volleyball match is made up of a first referee (R1), a second referee (R2), a scorer, a libero tracker, and 2 line judges. The R1 is in control of the match. The R1 has duties such as conducting the captains meeting before the start of the match and whistling to end the rally during play. Also, making ball handling calls and whistling violations during play. The second referee manages substitutions and time-outs. 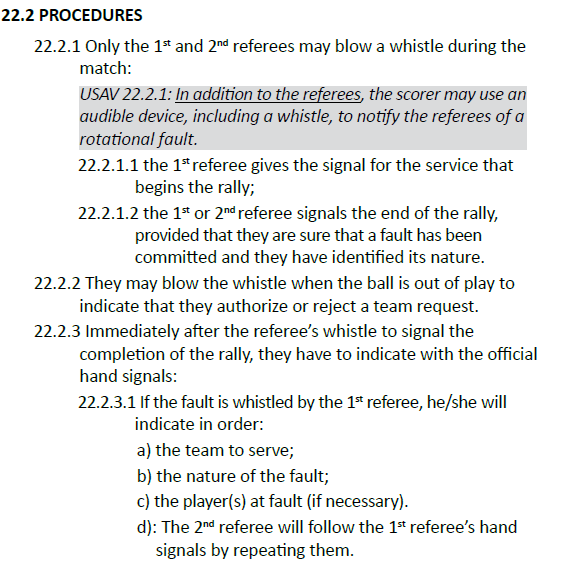 The second referee also assists the first referee by whistling net violations, centerline violations, ball contacting the antenna or any object outside the antenna, and out-of-rotation faults by the receiving team. The second referee assists the first referee by signaling (not whistling) ball handling violations, 4 team contacts (where the ball isn't returned to opponent after the 3rd contact), and multiple successive contacts by the same player. 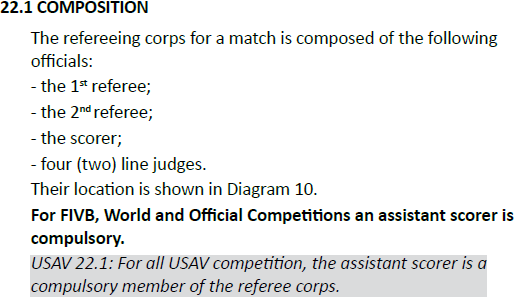 The second referee will also assist the first referee in any way the first referee asks to be. For example, it can be difficult to see pancakes. The first referee may decide to have the 2nd referee whistle the ball hitting the floor when the first referee doesn't have a good look. The 2nd referee may also be given the authority to call illegal back row blocks and illegal back row attacks. 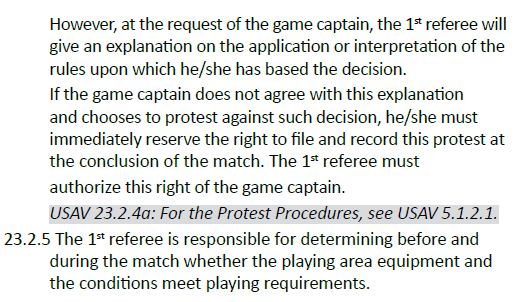 Also, the 2nd referee may be asked to assist the first referee for difficult situations such as the libero setting the ball to an attacker, where the attacker completes an attack hit with the entire ball above the top of the net. Also, it's difficult to tell how high the ball is for when a back row player attacks the ball from just inside the attack line. 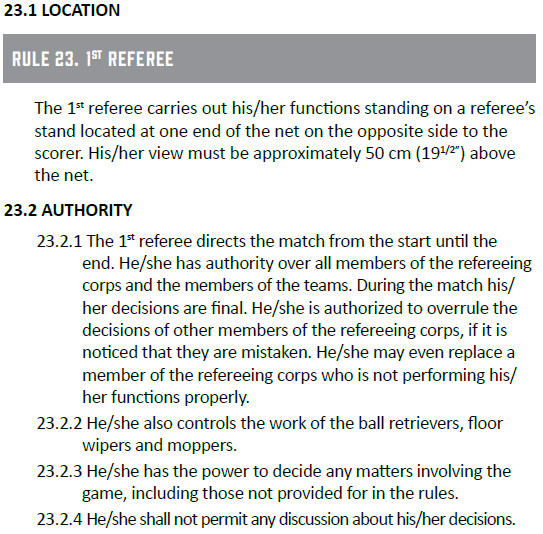 In this situation, the second referee often has a a better view of the play, so in this situation, the first referee may ask the second referee for help making a call. The line judges have responsibilities for calling touches off the blockers and defenders, signaling they didn't see the play, signaling the ball "in" or ball "out", signaling when the ball hits the antenna or crosses the net outside the antenna. The line judge also needs to make room for the server in the situation where the server comes close to the line judge for executing the serve (for example, jump serving down the left sideline).